BHS Custom Bollards provide an important safety barrier to protect personnel, equipment, and products from preventable damage. BHS manufactures Custom Bollards in its 128,000- square-foot Midwestern facility and can design them to match your specific needs. Strategically placed warehouse bollards can prevent costly accidents and injuries by providing a barrier between lift trucks and important infrastructure. For instance, using bollards at the ends of aisles can prevent the common forklift accident in which an operator cuts a corner too sharply, colliding with shelving units. Without proper precautions, accidents like these can be devastating. 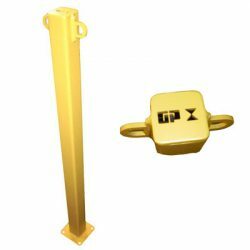 A well-placed bollard can deflect a blow and save the lift truck, shelving, and product from damage. Most importantly, preventing these accidents keeps the lift truck driver safe. Installing bollards between warehouse areas where forklifts operate and where they don’t gives an extra signal to staff to be cautious when they enter the forklift area. Bollards also prevent lift trucks from inadvertently leaving the lift truck zone. BHS Custom Bollards are painted OSHA yellow to catch the attention of drivers and pedestrians in the warehouse. Concrete anchors secure them at the base, allowing them stand up to serious collisions. To find out more about BHS Custom Bollards, Structural Barriers, or any other warehouse equipment, call +1 314 423 2075 . Our sales team can answer any questions about customization, like laser cutting your company’s logo on bollards. Call now or download our product catalogs here.